Kedron Brook Catchment Branch commenced a Frog Census in March, 2007. A Workshop on Frogs and their Identification was organised in October 2007 at Grinstead Park to help everyone to carry out a frog study in a consistent manner. Following keen interest from members, it was continued as adequate rainfall occured. The Committee purchased a special field recorder suited to recording frog calls on 24 bit Wave/MP3 stereo sound files. These can be stored on computers for further evaluation and comparison with reference sound spectrums of different species of frog. It is intended to purchase another global satellite locator to help exact location of frogs. This equipment assisted us to extend the depth of our studies in the rainy season in 2009. Our Frog Study Coordinator, Debbie Dolby, finalised her report on the studies conducted during 2007 and 2008. It detailed the methods used to identify the species of frogs found during these studies and the species found at 15 locations along Kedron Brook. 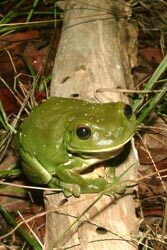 These results were then related to those reported by Dr Seonaid Melville in 2001, and observed by members of The Queensland Frog Society during the Summer of 1998. It was found that, given the relatively poor availability of past observations, it was important that further studies be conducted and these should be based upon standardised data sheets to allow for consistent reporting into the BCC Fauna Database. With time, the buildup of an adequate knowledge about the types of frog species found in relation to the type of environmental habitat will yield a better understanding of those significant parameters affecting the biodiversity and numbers of frogs. This evidence can then be used to promote greater awareness in public and corporate sectors leading to better management practices along the Brook. 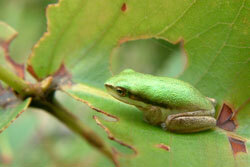 The report, "Kedron Brook Frog Census 2007 & 2008" is available for download as an 220 KB pdf file.